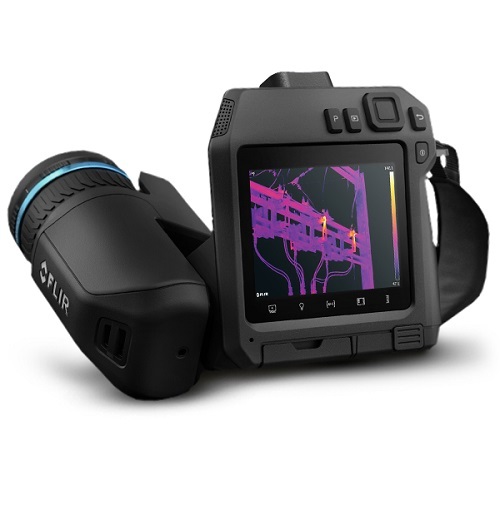 The FLIR T840 infrared (IR) camera is designed to help electric utility and other thermography professionals comfortably survey equipment both indoors or outdoors and seek out signs of failure all day long. The FLIR T840 infrared (IR) camera is designed to help electric utility and other thermography professionals comfortably survey equipment both indoors or outdoors and seek out signs of failure all day long. Thanks to an integrated eyepiece viewfinder and a bright 4-inch colour LCD display, the T840 makes it easy to conduct inspections outside in bright, challenging lighting conditions. The 180-degree rotating lens platform and thoughtful ergonomic design allow the T840 to help users diagnose hard-to-reach components in a variety of environments. With advanced on-camera measurement tools such as 1-touch level/span and laser-assisted autofocus, one can record accurate temperature measurements every time. Avoid costly power outages and plant shutdowns through regular predictive maintenance routines with this flexible and innovative IR camera. Safely and comfortably assess equipment and prevent component failure from any vantage point, in any lighting condition. Advanced imaging technology and superior sensitivity help you make the right call – fast. Get the most out of your work day with rapid reporting features that help you organise findings in the field. Scan outdoor equipment from a safe distance using the integrated eyepiece viewfinder. Share lenses across your fleet of cameras thanks to AutoCal optics. Ensure crisp thermal imagery and spot-on temperature readings every time with laser assisted autofocus. Get industry-leading image clarity from FLIR Vision Processing, MSX, UltraMax, and proprietary adaptive filtering. IR Resolution 464 x 348 pixels. Accuracy (±) 2-degree C or (±) 2 per cent of reading. Object temperature range (-) 20-degree C to 120-degree C; 0-degree C to 650-degree C; 300-degree C to 1500-degree C.